A tavola! The signal for whoever’s in hearing range to gather around the dinner table, breaking bread together and chatting about the day’s events. More often than not, that table talk is about food—tonight’s pasta al pomodoro, last week’s grilled fish, the crostata to be baked tomorrow with juicy apricots from the market. Hence, the name of my blog: Tavola Talk. I’m Toni Lydecker. Come join me in exploring the flavors and seasonal rhythms of eating the Italian way. In Italy, whenever possible, but also anywhere else in the world, whether it’s Florida, New England or Greece. Turns out even places with different culinary traditions, like Mexico, share some commonalities with Italian cooking. My interest in Italian food dates back to the year my husband and I moved to Florence with our newborn daughter. While he plowed through 15th-century documents in the archives, I pushed a stroller, with baby Kate sitting calmly amid bags of edibles from neighborhood markets. At home I cooked what I’d found, armed at first with well-thumbed copies of Marcella Hazan’s books but eventually relying on tips from the butcher or a neighbor, Italian food magazines and cookbooks, an idea from a dish tasted in a restaurant. We suffered through a few leaden risottos & other mishaps but by the end of our Italian sojourn, I could make lots of good things with melodic names: acquacotta, frittata, stracotto. By then, I understood the importance of following the seasons and going for quality in choosing ingredients. Back in the U.S., I began a career as a food writer that took many forms. 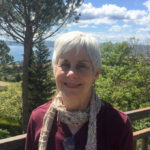 Writing magazine articles, editing a restaurant magazine, teaching classes on regional Italian cooking, working with consortiums to promote artisanal Italian foods. Along the way, I got formal culinary training. But my real education was on the job: researching articles, talking with chefs and home cooks, developing and testing recipes. 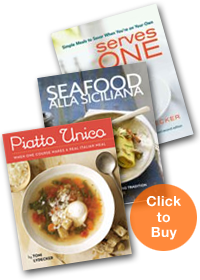 Eventually I had the opportunity to write Italian cookbooks. Seafood alla Siciliana: Recipes and Stories from a Living Tradition, was based on intensive research in Sicily. Piatto Unico: When One Course Makes a Real Italian Meal is filled with recipes I’ve collected over the years for delicious one-dish meals seasoned with Italian flair. I’m endlessly amazed at the way sharing food and talk about food can enrich our lives. There is pain but also joy in doing food-related volunteering that brings me face to face with people who struggle to put food on their families’ plates. I care about them, about cooking for my family and friends, about passing on some of what I know to my daughters and grandchildren. What runs through all of my personal and professional activities is a love of food—above all, Italian food—and a belief in the power of words to help us appreciate this amazing part of life.